One in six millennials has $100,000 squirreled away in a savings account, 401(k), IRA, or investment fund. Almost half of millennials have managed to put away $15,000. It’s not just a matter of select millennials being rich, either—one in three of those with $100,000-plus saved makes less than $90,000 a year. In the decade since the financial downturn, millennials have picked up a reputation for being financially lackluster over-spenders who definitely don’t put money away for retirement. They are burdened by student debt, struggle to find employment, and change jobs often. 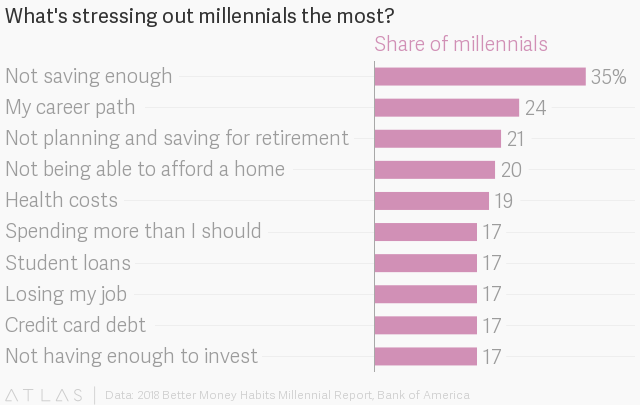 Except according to a new report from Bank of America, those realities have actually made millennials highly conscientious about their finances. The bank surveyed 1,500 Americans, ages 18 to 71, equally sampling over age, gender, race, location, and income. Their data show that 63% of millennials save, 54% budget, 57% have a savings goal, and 59% feel financially secure. Close to three-fourths (73%) say that when they make a budget, they stick to it most months. That puts millennials on pretty similar footing with older generations. Gen-Xers save and budget at similar rates, and a smaller share have a savings goal (42%). A larger share of Boomers save (75%), as many are already well into retirement. Part of millennials’ financial competency has to do with age. Only 5% of younger millennials (ages 23 to 27) have $100,000 put away, and one in three has saved $15,000. One in five older millennials (ages 28-37) has $100,000 in savings. Yet despite their thriftiness, millennials still buy the negative stereotypes about themselves. Sixty-four percent think their generation isn’t good at managing money, 73% think they spend on unnecessary indulgences, and 75% think they spend more than other generations. The generation’s largest fear? Not saving enough.